It has been suggested that both moderate- and vigorous-intensity physical activity reduces the risk of breast cancer. However, the effect of moderate-intensity physical activity on breast cancer risk has not been consistently evaluated by menopausal status and has not been evaluated in Mexican women. 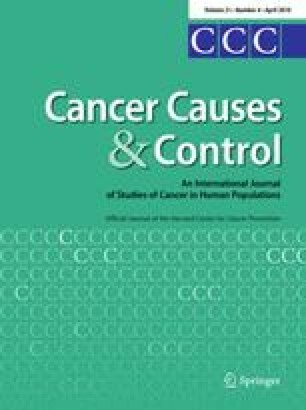 To evaluate the effect of moderate-intensity physical activity (h/week and MET-h/week) on the risk of breast cancer by menopausal status in Mexican women. A population-based case–control study was conducted in Mexico. One thousand incident cases and 1,074 matched controls to cases by 5 years of age, site and health institution participated in the study. Women provided information on health, diet and physical activity by means of an in-person interview. Anthropometric measurements and blood samples were obtained from all women. A conditional logistic regression model was used to assess this association. Participating in moderate-intensity physical activity decreased the risk of BC in both pre- and postmenopausal women (OR = 0.96; 95% CI 0.92.–0.99; OR = 0.90; 95% CI 0.86–0.93, respectively) for every 3 h per week of moderate-intensity physical activity. There was a statistically significant modification effect by menopausal status (p = 0.009). Strategies need to be identified that will engage women in physical activity programs. We would like to recognize CONACyT for the financial support provided for this work and all physicians responsible for the project in the different participating hospitals: Dr. Germán Castelazo (IMSS, Ciudad de México, DF), Dr. Sinhué Barroso Bravo (IMSS, Ciudad de México, DF), Dr. Fernando Mainero Ratchelous (IMSS, Ciudad de México, DF), Dr. Joaquín Zarco Méndez (ISSSTE, Ciudad de México, DF), Dr. Edelmiro Pérez Rodríguez (Hospital Universitario, Monterrey, Nuevo León), Dr. Jesús Pablo Esparza Cano (IMSS, Monterrey, Nuevo León), Dr. Heriberto Fabela (IMSS, Monterrey, Nuevo León), Dr. Fausto Hernández Morales (ISSSTE, Veracruz, Veracruz), Dr. Pedro Coronel Brizio (CECAN SS, Xalapa, Veracruz) and Dr. Vicente A. Saldaña Quiroz (IMSS, Veracruz, Veracruz).